This article is about the U.S. oath of allegiance. For the general topic of oaths of allegiance, see Oath of allegiance. For other uses, see Pledge of Allegiance (disambiguation). "I pledge allegiance to the Flag of the United States and to the Republic for which it stands, one nation, indivisible, with liberty and justice for all." 3.1 Addition of "under God"
Congressional sessions open with the recital of the Pledge, as do many government meetings at local levels, and meetings held by many private organizations. 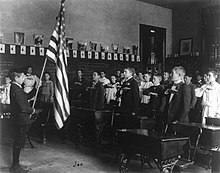 All states except Hawaii, Iowa, Vermont and Wyoming require a regularly scheduled recitation of the pledge in the public schools, although the Supreme Court has ruled in West Virginia State Board of Education v. Barnette that students cannot be compelled to recite the Pledge, nor can they be punished for not doing so. In a number of states, state flag pledges of allegiance are required to be recited after this. Balch was a proponent of teaching children, especially those of immigrants, loyalty to the United States, even going so far as to write a book on the subject and work with both the government and private organizations to distribute flags to every classroom and school. 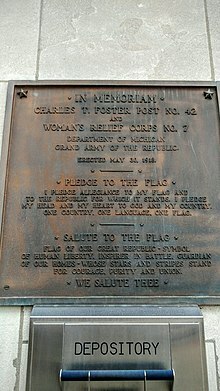 Balch's pledge, which predates Bellamy's by 5 years and was embraced by many schools, by the Daughters of the American Revolution until the 1910s, and by the Grand Army of the Republic until the 1923 National Flag Conference, is often overlooked when discussing the history of the Pledge. Bellamy, however, did not approve of the pledge as Balch had written it, referring to the text as "too juvenile and lacking in dignity." The Bellamy "Pledge of Allegiance" was first published in the September 8 issue of the popular children's magazine The Youth's Companion as part of the National Public-School Celebration of Columbus Day, a celebration of the 400th anniversary of Christopher Columbus's arrival in the Americas. The event was conceived and promoted by James B. Upham, a marketer for the magazine, as a campaign to instill the idea of American nationalism in students and to encourage children to raise flags above their schools. According to author Margarette S. Miller, this campaign was in line both with Upham's patriotic vision as well as with his commercial interest. According to Miller, Upham "would often say to his wife: 'Mary, if I can instill into the minds of our American youth a love for their country and the principles on which it was founded, and create in them an ambition to carry on with the ideals which the early founders wrote into The Constitution, I shall not have lived in vain.'" In his recollection of the creation of the Pledge, Francis Bellamy said, "At the beginning of the nineties patriotism and national feeling was (sic) at a low ebb. The patriotic ardor of the Civil War was an old story ... The time was ripe for a reawakening of simple Americanism and the leaders in the new movement rightly felt that patriotic education should begin in the public schools." James Upham "felt that a flag should be on every schoolhouse," so his publication "fostered a plan of selling flags to schools through the children themselves at cost, which was so successful that 25,000 schools acquired flags in the first year (1892–93). As the World's Columbian Exposition was set to celebrate the 400th anniversary of the arrival of Christopher Columbus in the Americas, Upham sought to link the publication's flag drive to the event, "so that every school in the land ... would have a flag raising, under the most impressive conditions." Bellamy was placed in charge of this operation and was soon lobbying "not only the superintendents of education in all the States, but [he] also worked with governors, Congressmen, and even the President of the United States." The publication's efforts paid off when Benjamin Harrison declared Wednesday October 12, 1892, to be Columbus Day for which The Youth's Companion made "an official program for universal use in all the schools." Bellamy recalled that the event "had to be more than a list of exercises. The ritual must be prepared with simplicity and dignity." Edna Dean Proctor wrote an ode for the event, and "There was also an oration suitable for declamation." Bellamy held that "Of course, the nub of the program was to be the raising of the flag, with a salute to the flag recited by the pupils in unison." He found "There was not a satisfactory enough form for this salute. The Balch salute, which ran, "I give my heart and my hand to my country, one country, one language, one flag," seemed to him too juvenile and lacking in dignity." After working on the idea with Upham, Bellamy concluded, "It was my thought that a vow of loyalty or allegiance to the flag should be the dominant idea. I especially stressed the word 'allegiance'. ... Beginning with the new word allegiance, I first decided that 'pledge' was a better school word than 'vow' or 'swear'; and that the first person singular should be used, and that 'my' flag was preferable to 'the.'" Bellamy considered the words "country, nation, or Republic," choosing the last as "it distinguished the form of government chosen by the founding fathers and established by the Revolution. The true reason for allegiance to the flag is the Republic for which it stands." Bellamy then reflected on the sayings of Revolutionary and Civil War figures, and concluded "all that pictured struggle reduced itself to three words, one Nation indivisible." After being reviewed by Upham and other members of The Youth's Companion, the Pledge was approved and put in the official Columbus Day program. Bellamy noted that "in later years the words 'to my flag' were changed to 'to the flag of the United States of America' because of the large number of foreign children in the schools." Bellamy disliked the change, as "it did injure the rhythmic balance of the original composition." A plaque in Lansing, Michigan, dated 1918, listing the Balch Pledge, which was used parallel to the Bellamy Pledge until the National Flag Conference in 1923. "Under God" redirects here. For the book, see Under God (book). Even though the movement behind inserting "under God" into the pledge might have been initiated by a private religious fraternity and even though references to God appear in previous versions of the pledge, historian Kevin M. Kruse asserts that this movement was an effort by corporate America to instill in the minds of the people that capitalism and free enterprise were heavenly blessed. Kruse acknowledges the insertion of the phrase was influenced by the push-back against Russian atheistic communism during the Cold War, but argues the longer arc of history shows the conflation of Christianity and capitalism as a challenge to the New Deal played the larger role. In 1892, Francis Bellamy created what was known as the Bellamy salute. It started with the hand outstretched toward the flag, palm down, and ended with the palm up. 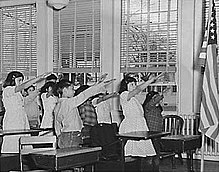 Because of the similarity between the Bellamy salute and the Nazi salute, which was adopted in Germany later, the US Congress stipulated that the hand-over-the-heart gesture as the salute to be rendered by civilians during the Pledge of Allegiance and the national anthem in the US would be the salute to replace the Bellamy salute. 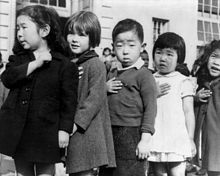 Removal of the Bellamy salute occurred on December 22, 1942, when Congress amended the Flag Code language first passed into law on June 22, 1942. Attached to bills passed in Congress in 2008 and then in 2009 (Section 301(b)(1) of title 36, United States Code), language was included which authorized all active duty military personnel and all veterans in civilian clothes to render a proper hand salute during the raising and lowering of the flag, when the colors are presented, and during the National Anthem. Requiring or promoting of the Pledge on the part of the government has continued to draw criticism and legal challenges on several grounds. One objection is that a democratic republic built on freedom of dissent should not require its citizens to pledge allegiance to it, and that the First Amendment to the United States Constitution protects the right to refrain from speaking or standing, which itself is also a form of speech in the context of the ritual of pledging allegiance. Another objection is that the people who are most likely to recite the Pledge every day, small children in schools, cannot really give their consent or even completely understand the Pledge they are making. Another criticism is that a government requiring or promoting the phrase "under God" violates protections against the establishment of religion guaranteed in the Establishment Clause of the First Amendment. In 2004, linguist Geoffrey Nunberg said the original supporters of the addition thought that they were simply quoting Lincoln's Gettysburg Address, but to Lincoln and his contemporaries, "under God" meant "God willing", so they would have found its use in the Pledge of Allegiance grammatically incorrect and semantically odd. Prominent legal challenges were brought in the 1930s and 1940s by Jehovah's Witnesses, a denomination whose beliefs preclude swearing loyalty to any power other than God, and who objected to policies in public schools requiring students to swear an oath to the flag. They said requiring the pledge violated their freedom of religion guaranteed by the Free Exercise Clause of the First Amendment. The first case was in 1935, when two children, Lillian and William Gobitas, ages ten and twelve, were expelled from the Minersville, Pennsylvania, public schools that year for failing to salute the flag and recite the Pledge of Allegiance. In a 2002 case brought by atheist Michael Newdow, whose daughter was being taught the Pledge in school, the Ninth Circuit Court of Appeals ruled the phrase "under God" an unconstitutional endorsement of monotheism when the Pledge was promoted in public school. In 2004, the Supreme Court heard Elk Grove Unified School District v. Newdow, an appeal of the ruling, and rejected Newdow's claim on the grounds that he was not the custodial parent, and therefore lacked standing, thus avoiding ruling on the merits of whether the phrase was constitutional in a school-sponsored recitation. On January 3, 2005, a new suit was filed in the U.S. District Court for the Eastern District of California on behalf of three unnamed families. On September 14, 2005, District Court Judge Lawrence Karlton ruled in their favor. Citing the precedent of the 2002 ruling by the Ninth Circuit Court of Appeals, Judge Karlton issued an order stating that, upon proper motion, he would enjoin the school district defendants from continuing their practices of leading children in pledging allegiance to "one Nation under God." In 2006, in the Florida case Frazier v. Alexandre, a federal district court in Florida ruled that a 1942 state law requiring students to stand and recite the Pledge of Allegiance violates the First and Fourteenth Amendments of the U.S. Constitution. As a result of that decision, a Florida school district was ordered to pay $32,500 to a student who chose not to say the pledge and was ridiculed and called "unpatriotic" by a teacher. In 2009, a Montgomery County, Maryland, teacher berated and had school police remove a 13-year-old girl who refused to say the Pledge of Allegiance in the classroom. The student's mother, assisted by the American Civil Liberties Union of Maryland, sought and received an apology from the teacher, as state law and the school's student handbook both prohibit students from being forced to recite the Pledge. On March 11, 2010, the Ninth Circuit Court of Appeals upheld the words "under God" in the Pledge of Allegiance in the case of Newdow v. Rio Linda Union School District. In a 2–1 decision, the appellate court ruled that the words were of a "ceremonial and patriotic nature" and did not constitute an establishment of religion. Judge Stephen Reinhardt dissented, writing that "the state-directed, teacher-led daily recitation in public schools of the amended 'under God' version of the Pledge of Allegiance... violates the Establishment Clause of the Constitution." On November 12, 2010, in a unanimous decision, the United States Court of Appeals for the First Circuit in Boston affirmed a ruling by a New Hampshire lower federal court which found that the pledge's reference to God does not violate non-pledging students' rights if student participation in the pledge is voluntary. A United States Supreme Court appeal of this decision was denied on June 13, 2011. In September 2013, a case was brought before the Massachusetts Supreme Judicial Court, arguing that the pledge violates the Equal Rights Amendment of the Constitution of Massachusetts. In May 2014, Massachusetts' highest court ruled that the pledge does not discriminate against atheists, saying that the words "under God" represent a patriotic, not a religious, exercise. 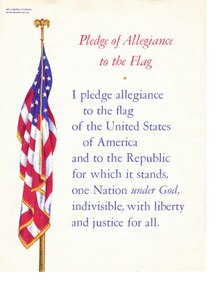 ^ a b "The Pledge of Allegiance". Historic Documents. Independence Hall Association: ushistory.org. Retrieved 29 August 2012. ^ Jones, Jeffrey Owen. "The Man Who Wrote the Pledge of Allegiance," Smithsonian Magazine, Nov. 2003. Retrieved June 14, 2018. ^ a b "The Pledge of Allegiance," Celebrating America's Freedoms. n.d. U.S. Dept. of Veterans Affairs. Retrieved June 14, 2018. ^ a b "Title 4, Chapter 1, Section 4, US Code". Retrieved January 24, 2016. ^ Kirkpatrick, Melanie. "One Nation, Indivisible". The Wall Street Journal. ISSN 0099-9660. Retrieved November 1, 2015. ^ "Captain and Brevet Lieutenant Colonel George T. Balch, Ordnance Corps Hall of Fame Inductee 2001, U.S. Army Ordnance Corps". www.goordnance.army.mil. Retrieved November 1, 2015. ^ "Society & Community. Faith in America: The Legal Dilemma". NOW with Bill Moyers. PBS. June 29, 2002. ^ "The Pledge of Allegiance and Our Flag of the United States". Their History and Meaning. Archived from the original on September 23, 2006. Retrieved January 8, 2014. ^ "American & State Pledges". Speck's Web. November 16, 2013. Retrieved September 4, 2014. ^ U.S. Code 2011, Title 4, Chap. 1, Sec. 4. Government Printing Office. Retrieved 22 September 2017. ^ Kubal, Timothy (October 2008). Cultural Movements and Collective Memory: Christopher Columbus and the Rewriting of the National Origin Myth. Basingstoke, Hampshire, GBR: Palgrave Macmillan. ISBN 978-0-230-61576-2. ^ "Grand Lodge of BC and Yukon profile of Bellamy". Freemasonry.bcy.ca. Retrieved October 23, 2013. ^ The Overland Monthly. Samuel Carson. January 1, 1891. ^ a b Daughters of the American Revolution Magazine. National Society of the Daughters of the American Revolution. January 1, 1906. ^ a b c d e f g h i j k l m n o p q r Francis Bellamy. ""A Brief Synopsis of the Story of the Origin of the Pledge taken from the Detailed Narrative by Francis Bellamy, Author of the Pledge"". Congressional Record 91 Cong. Rec. (1945) House: 5510–5511. ^ a b Bellamy, Francis, "The Story of the Pledge of Allegiance to the Flag," University of Rochester Library Bulletin, Vol. VIII, Winter 1953. ^ Margarette S. Miller (1946). I Pledge Allegiance. Christopher Publishing House, Youth's companion. ^ Francis Bellamy – The word "to" was inserted between "my Flag and" and "the Republic" in October 1892. ^ Dr. John W. Baer. "The Pledge of Allegiance A Short History". Archived from the original on September 27, 2010. ^ Congressional Serial Set. U.S. Government Printing Office. January 1, 1917. ^ Proceedings of the ... Continental Congress of the National Society of the Daughters of the American Revolution. The Congress. January 1, 1915. ^ Pub.L. 77-623, Chap. 435, 56 Stat. 377, H.J.Res. 303, enacted June 22, 1942. ^ a b c Baer, John W. (2007). The Pledge of Allegiance: A Revised History and Analysis, 1892–2007. Annapolis, MD: Free State Press. ^ Merriman, Scott A. (2007). Religion and the Law in America: An Encyclopedia of Personal Belief. ABC-CLIO. ISBN 978-1-85109-863-7. p. 110. ^ "Knights of Columbus Fact Sheet" (PDF). Knights of Columbus. Retrieved June 16, 2011. ^ a b "How the words "UNDER GOD" came to be added to the Pledge of Allegiance to the Flag" (PDF). Retrieved October 23, 2013. ^ Broadway, Bill. "How 'Under God' Got in There," The Washington Post, July 6, 2002. Retrieved February 4, 2018. ^ a b Pub.L. 83-396, Chap. 297, 68 Stat. 249, H.J.Res. 243, enacted June 14, 1954. ^ "God In America: God in the White House". PBS. ^ "How 'One Nation' Didn't Become 'Under God' Until The '50s Religious Revival". NPR. ^ Leepson, Marc (2006). Flag: An American Biography. Macmillan. p. 171. ISBN 0-312-32309-3. ^ "Rules for Rendering Hand Salute of U.S. Flag". Military.com. ^ Inc, Nielsen Business Media (April 20, 1957). Billboard. Nielsen Business Media, Inc.
^ Inc, Nielsen Business Media (September 19, 1960). Billboard. Nielsen Business Media, Inc.
^ "Irving Caesar Welcome". www.irvingcaesar.com. Retrieved July 2, 2017. ^ ""Pledge of Allegiance to the Flag" H. Con. Res. 161 Statute 69 Pages B24–B25 Concurrent Resolutions - July 26, 1955" (PDF). ^ "U.S. Copyright Office, Copyright search for "The Pledge of Allegiance to the Flag"". ^ West Virginia State Board of Education v. Barnette , 319 U.S. 624, 642 (U.S. Supreme Court 1943). ^ a b Holloman ex rel. Holloman v. Harland , 370 F.3d 1252 (11th Cir. 2004). ^ Robinson, Nathan J. (June 25, 2018). "I can't believe they still make students recite the Pledge of Allegiance". Current Affairs. Retrieved 8 March 2019. ^ Olander, Herbert T. (December 1941). "Children's Knowledge of the Flag Salute". The Journal of Educational Research. 35 (4): 300–305. JSTOR 27528245. ^ "Court upholds 'under God' in Pledge of Allegiance". Associated Press. March 11, 2010. Archived from the original on March 16, 2010. Retrieved March 11, 2010. ^ "The Dangerous Fallacy of Ceremonial Deism: Governmental religious expressions are not harmless". Psychology Today. May 24, 2012. ^ Geoffrey Nunberg (June 20, 2004). "I Might Have Guessed Parson Weems Would Figure In There Somewhere". Language Log. Retrieved May 3, 2007. ^ Geoffrey Nunberg (June 20, 2004). ""(Next) Under God," Phrasal Idiom". Language Log. Retrieved May 3, 2007. ^ Jehovah's Witnesses-Proclaimers of God's Kingdom, Watchtower Bible and Tract Society of New York, 1993, pp. 196–197. ^ "Flag Salute Cases". The Free Dictionary. Retrieved February 3, 2014. ^ Frazier v. Alexandre , 434 F.Supp.2d 1350 (S.D. Fla. May 31, 2006). ^ "Frazier v. Alexandre, No. 05-81142 (S.D. Fla. May 31, 2006)". National School Boards Association. March 15, 2011. Archived from the original on March 15, 2011. ^ Johnson, Jenna (February 24, 2010). "Pledge of Allegiance dispute results in Md. teacher having to apologize". The Washington Post. Retrieved February 25, 2010. ^ a b Chea, Terence (March 12, 2010). "Fed. appeals court upholds 'under God' in pledge". Associated Press. Archived from the original on March 15, 2010. Retrieved March 12, 2010. ^ "Pledge of Allegiance's God reference now upheld by court". LA Times. March 12, 2010. Retrieved January 11, 2011. ^ Supreme Court of the United States (June 13, 2011). "Freedom From Religion Foundation, Petitioner v. United States, et al". Supreme Court of the United States. Retrieved June 15, 2011. ^ "'Under God' part of Pledge of Allegiance under review in Massachusetts". CNN.com. September 4, 2013. Retrieved October 23, 2013. ^ "Massachusetts court rules 'under God' in pledge does not discriminate against atheists". The Washington Post. May 9, 2014. ISSN 0190-8286. Retrieved February 13, 2016. ^ a b "'Under God' is not discriminatory and will stay in pledge, judge says". NJ.com. Retrieved June 12, 2015. ^ Salvador Rizzo. "Hearing 'Under God' in Pledge of Allegiance does not violate rights of atheist students, NJ judge rules". NorthJersey.com. Archived from the original on March 10, 2016. Retrieved February 29, 2016. Martin, Leisa A. (May–June 2008). "Examining the Pledge of Allegiance". Social Studies. 99 (3): 127–131. doi:10.3200/tsss.99.3.127-131. John W. Baer (2007). The Pledge of Allegiance: A Revised History and Analysis, 1892–2007 (Free State Press, Inc.) ISBN 978-0-9650620-2-2 Excerpt, Chapter Eight: "Under God" and Other Questions About the Pledge. Kevin M. Kruse (2015). One Nation Under God: How Corporate America Invented Christian America, Basic Books, ISBN 0465049494. This page was last edited on 21 March 2019, at 14:03 (UTC).